One of the first skills you should learn in poker is what hands are better than others. Before you even play a hand, you must know what hands beat what and what consists of a good hand to play. You have already learnt what final hands beat what in our Poker Hand Ranking article. In this article we are going to look at the Starting Hands in Texas Holdem, these are the two cards that are dealt to each player sometimes also called the “hole cards”. What are the Best Poker Starting Hands? The perception of what is a strong starting hand in poker will differ from one player to the next, but the numbers don’t lie when it comes to what hands are mathematically better than the rest. Poker is a game based on probability and so the statistics are clear cut when it comes to which are the best Texas Holdem starting hands. Everyone knows that pocket Aces is the strongest starting hand in Texas Holdem and that there aren’t many situations where you are going to fold these regardless of the situation. However, the line that’s drawn from there can be somewhat of a debate. Changing Value of Starting Hands – How Many Opponents are you up against? An overlooked aspect of starting hands is how their value and strength will fluctuate with the number of players at the table or how many opponents you are facing. Playing pocket Aces in a hand against one single opponent (everyone else has folded) gives you an 85.3% probability of winning the hand (pretty good hey!). Now play that same A-A against 9 opponents in a hand and the probability of you winning has just dropped down to 31.1%, that means for every three times you play you would lose twice! This is why we change our strategy with certain types of hands. 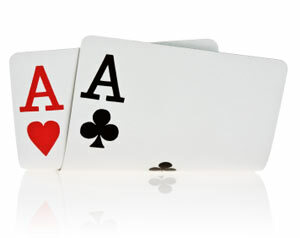 For example, Hands such as big Pairs and big Aces will have a higher expected return versus only 1 or 2 opponents. As soon as you get more players in the pot, their value will go down drastically, especially your big Ace type hands (AK, AQ etc.). Many players often trap with big hands like A-K trying to catch someone off guard. Next thing you know, there are 5 people in the pot and your A-K may as well be 7-2 at this point. This is why raising with big starting hands in Texas Holdem is key to their long-term win-rate. On the flip side, you have drawing hands where the starting hand value in itself is not high and won’t win you the pot, but you are looking to make a big hand by connecting (or “drawing to”) the community cards. With drawing hands they play much better with more people in the pot and when you can see a cheap flop with them. Their value comes mostly from making big draws that are usually good at showdown, but are achieved less often, which means there must be more money in the pot for them to have a positive expectation. For the most part, I’m speaking in general terms here. No hand should be played strictly for its value and we should always be playing our opponents and the situation, not just our hand strength. But, this article is to give you an idea about the actual value of starting hands in Texas Holdem, not how to play them. Many hands can be grouped into categories that have a relative similar value in regards to pre-flop strength. Lets take a look at each category below. The percentages included below are the probability that you will win the hand based on that starting hand and assumes you are playing against one single opponent. As we have discussed above, the more opponents in a hand, the lower your probability of winning becomes. Note: Where stated, suited means the two cards are of the same suit and offsuit means the two cards are of different suits. All other suited connectors have roughly the same value, give or take 1 percent. For the most part, hands such as: 67s-54s etc… will have the same exact value pre-flop. If we take a closer look at the figures above we will notice some occurrences that many players don’t realise. You will notice that having suited cards makes the value of a hand go up a decent amount. You will also notice that a hand like AJs has a better chance at winning then AQo. If you go down the list, you will notice this happening with almost group of starting hands. The list above covers what most players with a solid grasp of the game will choose as their starting hands. You may add some in, but if we were to add all hands that every type of player would choose to play, this would take up 3 or 4 more pages. If you want to delve more deeply into the probability of every starting hand and the changing value against more opponents then here is a great resource on Pre Flop Odds. Now, you may be thinking, why aren’t all suited hands on this list? You may elect to play any suited cards, regardless of what two they are, but let’s use an example to demonstrate how little value 2 random suited cards have. A common hand you will see played at the lower stakes will be a hand such as Q2 suited. They see a high card and another card of the same suit and think it has to have some value. While it does hold its place in poker, it doesn’t take up much of it. The actual percentage that this will hand will win at showdown will be 49.9% against one opponent. That means you are actually an underdog in the hand and your opponent is favourite to win. Moral of the story is, don’t play 2 random, suited cards just because they’re suited and look pretty! Now that we have a better understanding of the actual probability of winning with each starting hand, you should be able to identify which starting hands actually represent strength rather than those that just look a lot better than they actually are. Use this to formulate a starting hand strategy to take advantage of this. You will probably find that not playing certain hands that you once were can make you much more profitable. In poker, sometimes not playing a hand is just as important as how you play a hand.